Lengthy meandering summary of research studies about aging. The Happiness Curve is found worldwide in both males and females and even in apes. 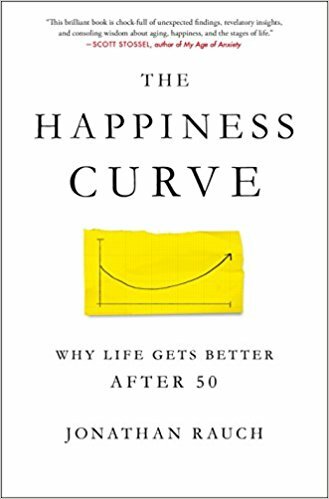 The curve shows that people get decreasingly satisfied with life (the definition of happiness used here) from age 20 to their early 50s. After bottoming out, their happiness grows until old age diseases occur sometime in their 80s. Studies cited conclude that at around 50, people get more realistic about what they can still achieve. This jolt to reality is painful and may result in the stereotypical mid-life crisis of divorce, career change and sport cars. A few people may have an ascending line or a V curve depending on their life experiences. Therefore, it is possible to avoid the common depression of mid-life but it is harder then than during other phases of life. I wanted to like and recommend this book. However, I didn’t and I can’t. The Happiness Curve is full of personal experiences of the author and people he met. I don’t think they added anything other than more pages. Please just get to the information promised in the book’s summary. 2 stars. Thanks to the publisher, Thomas Dunne Books, and NetGalley for an advanced copy.